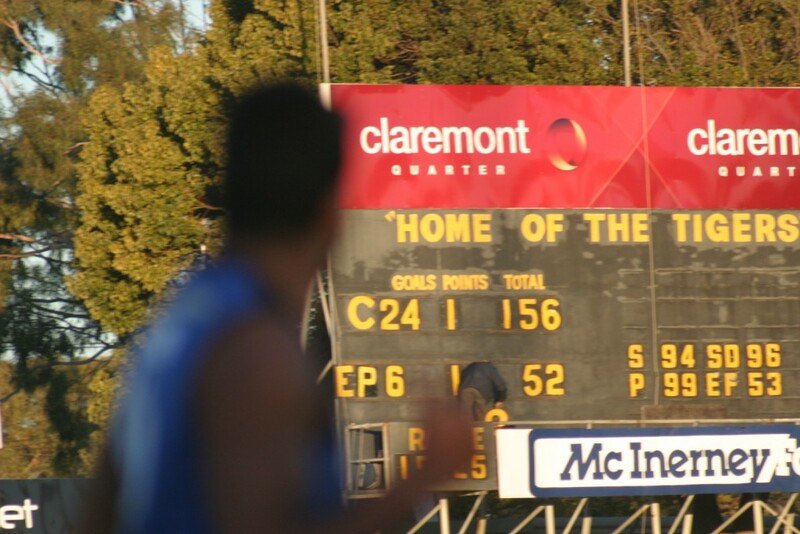 This glance at the scoreboard at Claremont Oval by East Perth’s Andrew Lovett told the sad story of a hundred point hammering. Claremont are pretty successful in WAFL. They lost the grand final by a point in 2010. They produce a lot of AFL players. But they have the worst following in the competition. Past players include George Maloney, Graham Moss, Denis Marshall, John McIntosh, Jim Krakouer, Phil Krakouer, Guy McKenna, Ken Hunter, Chris Lewis, Derek Kickett, Dale Kickett, Michael Mitchell and Ben Allan – so the Tigers would put together an exciting All-Stars line-up. Claremont has also been a lure for players from Victoria over the years. Peter Pianto and Verdun Howell had stints as coach while Geoff Blethyn, Barry Price, Laurie Mithen, John Evans, Bob Greenwood, Daryl Griffiths and Colin Tully have been among those to make the move west. Developers have looked hungrily at the oval for years and the site will be redeveloped at the end of 2011 season. The Tigers will be looking for a new home and will probably end up at the nearby Showgrounds.